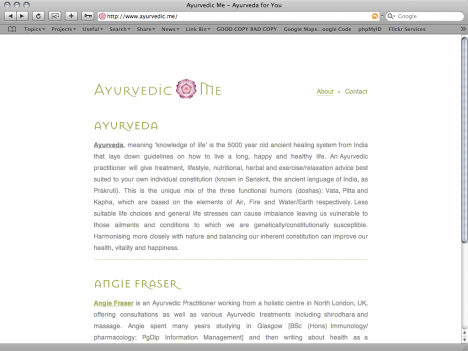 I've been slowly working on the design and identity for Angie's Ayurveda Practice over the last few months - amongst everything else - and have just put up the start of her website. Simplicity is order of the day, keeping everything clean and minimal, maybe too minimal at the moment, but there is more to come in the days, weeks, months and years that follow. The office of AAA in Paris, complete with recylced bottle lampshades. Well, the week does not feel like it's quite over yet - I'm working my way through Saturday - but as my Mac has just seized up I thought I'd start work on this update. This week started in Paris, visiting Atelier d'architecture autogÃ©rÃ©e (studio for self-managed architecture) - AAA for short - to talk through the creation of a website to allow the various participants of the Rhyzom project that they have started to document their activities and findings. Part of the aim is to do this in a structured way to allow the building of a map of the network of participants this creates, with the aim of this map extending further out after the initial project has completed, and to create a platform which grows with future projects rather than dies after it's initial active phase. The working meeting allowed me to start working on the structures and code needed to drive the site - though I have a worry that the structures are so complex that getting people to enter the information may be problematic - this is making me rethink some of my existing toolset and how people approach managing data in that. Travelling to and from Paris gave me a chance to catch up on some outstanding work on a new website for Avant Gardening a project which has been bubbling under for some time, a series of projects about gardening and environmental awareness in London. The new website is finally getting there - I've been working on it in fits and starts all week - so hopefully, issues with the domain names aside, we can get it live next week. On top of this I did some design and functional tweaks to my CMS Framework to make the extending structures of the kind of sites I make easier to manage - though it seems that most clients have a desire for quite complex outcomes and so it's often hard to reconcile that with usability. A never ending task of reduction and rethinking, but a useful one. On Wednesday I also managed to get on with a number of the updates to Spatial Agency (primarily in terms of CMS updates, but also a couple of design tweaks), an update to the CMS and some design tweaks on Rona Lee's website, as she ploughs into bringing her site up to date with her last burst of work, and a couple of other updates to the usual suspects from last week : Grizedale, Park, Somewhere, What Will The Harvest Be?, Rossi & Rossi. On Wednesday I also managed to dig further into the Lawson Park Electronic Library, getting all of the initial data loaded into the CMS on the live site, and getting the management interface for it (mostly) built. On Thursday I went to Sheffield, to help Studio 8 at Sheffield University School of Architecture. An initial presentation to some of the groups raised some interesting questions, such as issues about the longevity and worth of websites that stop being contributed to, especially given the level of lifestream noise created now. After the presentation I set to work with the group to look through data they have been gathering in the last weeks and apply some tactics for analysing and refining it to present a final mapping of issues they have found in Sheffield. This was interesting and challenging - they have gathered a lot of disparate information from many sources and are trying to bring it together in a cohesive way - initially using a Ning and Google Maps, this has faltered for a couple of reasons - the amount of data they have, and the limitations of the Tools at hand to present the complexities of the information. I tried to encourage them to look a the information in a new way, to work out what they were trying to say and what was the most pertinent way to present each core group of information they have, as a number of views of sheffield, rather than trying to put all of the information into one view that became overwhelming. I look forward to seeing the outcome; the have a lot to do in the next week or so, so wish them luck. In talking to the students I got the impression that there was a feeling that there would just be a 'technical' answer, which there seldom is - in fact part of the problem I constantly come across is the desire to create something with a complex outcome, and expect to be able to have it all simplified by some program or device. Unfortuantely that's seldom the outcome - computers can work much better the other way - analysing information to produce simplifications, but generally if you are trying to achieve something complex then it's going to take a while to sort it out. Finally, to a couple of days back home in front of the computer, working through Avant Gardening and Rossi & Rossi's websites - punctuated by some great Pho for lunch with Francisco Salvado, during which we bemoaned the homoginisation of corporate web design, something that I'm working against since my release from SHOWstudio and the ned to think less about the concerns of advertisers and marketplace, not that that stops me thinking about usability, but I also want to create work that engaged people through being challenging, at different levels. Sometimes work should be about the audience making an effort, as much as the the designer. I was hit yesterday evening with a new logo for Rossi & Rossi - which kind of throws my existing design (based on their previous logo) into disarray. I'm still working out how to manage that one. Got to love a client curve ball. A lot of today has been about that. The week ended on a nice note, with a request from Kieren Reed and Abigail Hunt to start building them a shared & split portfolilo site(s) for their work. It should be quite a straightforward job - a releif from some of the more complex issues I'm dealing with else where, but has it's own set of unique requirements which will make it it's own challenge as well. That should come into shape in early 2010. It's Saturday evening, and time to quickly review my week. I've noticed my weeknotes have been picked up elsewhere, which is sort of embarrassing. I hope my ramblings are useful - it's certainly interesting for me reading how other people progress with projects. Further work was done on Rossi & Rossi, rebuilding the site based upon their new logo. Fortunately my design wasn't too heavily reliant on the styling from their old logo, but it was still a bit of a pain to get all the alterations done on the site and get it back up and running nicely. Having done this I'm also not as happy with it as I was, and I've started refining the layouts, which is not speeding things up. On Tuesday I dug into some of the mapping work I'm doing on Spatial Agency, just playing around with Google Maps and trying some visualisations of location based data. Alas the information we have on each of the practises just specifies countries, so any spatial representation here is going to be minimal, but I think there are some worthwhile outcomes in it. I also got on with some of the more intensive mapping for the Rhyzom project with AAA and working through the complex interactions of different levels of contributors, events, projects, workshops, fieldtrips and locations. Painting a picture of this is intereting, but challenging. I think part of the challenge is coming from my desire to always approach the visualisation as much as a website as as a picture, and so I'm trying to build it in some form of semantic HTML structure. Rod for my own back. There was a quick meet with Donia from AAA yesterday evening to look at progress on this. It's not moved as quickly as I'd have liked it to, partially because of commitments elsewhere, and partially down to my focus on really understanding the structures before I start building. On Thursday I met up with the team at Afterall to review how they were feeling about their website, and what could do with being refined and improved. Overall they are happy with the site, but there are a few refinements to make, nothing to groundbreaking, but nice to really look at the usability and communication of this site rather than data structures and interactions of entities like a lot of the other projects. After than meeting I was staring into another with Paul Hetherington, former colleague and (soon-to-be-ex) Creative Director at SHOWstudio, to talk through his upcoming project. This project is going to be more commercial, but the underlying ideas behind it also give a lot of interesting possiblities. Don't want to give too much away at the moment - client confidentiality an all that - but looking forward to working on this in the New Year. Today has been spent working on the Lawson Park Electronic Library website, trying to get the first phase of this launched as soon as possible. I met up with Maria Benjamin (one half of collaborators on the project Guestroom ) and they like where I'm going with it. I hope to get the basic site up this week, and then we can really start extending the contents on the site. I've also started building the framework for the website(s) for Abigail Hunt and Kieren Reed I mentioned last week. in other related updates, I've updated the Grizedale Arts with some design refinements and with a job opening, internship offers, and available residencies and commissions, and a job opening - one I'd be tempted to apply for if I was more qualified. These will start feeding back into the work that I'm developing as part for the Lawson Park website and as part of my ongoing work with Grizedale Arts. This week has also started me really thinking that the decade is turning, and it's become apparent 2010 is going to be an even busier year. Looking my updates over the last few weeks I've realised that I need to become more foccused on each project to fulfil things quicker, so that's my plan for next year. Another reflection this week was not being able to contextualise the speed at which I do things. In some ways it seems slow (I imagine from the outside) but in other ways I feel it's fast. I think this is an issue to do with not working in a space with people who do the same as me - and also the time-sharing aspect of the way I approach my work. I also think it's externally people don't see the details going into things (code optimisation, structural tweeks, cross platform testing) which start to be a drain. Time-lapse of me at work in my previous office. It's been a long time. Somehow the weeks have run away with me, and 10 weeks later I find myself updating what's supposed to be a week note. Weak notes more like. In between then and now I've worked on a number of projects, taking some time of for christmas + new year (and being ill) and moved home + home office, and I'm gradually settling into a new working space. Having spent over 7 years building up my last working space it's quite hard to get used to the new space - making the desk right for my working habits and dealing with a smaller desk space. The new 'office' space allows Angie and I to share a room for working, when she's not elsewhere which keeps our work space out of the rest of our livening space, but also stops me from listening to so much weird music when Angie is here. Ergonomics have become quite a thing to work towards having been suffering from an increasing amount of RSI and back/neck pain in the last months - a combination of stress, DIY, lifting and moving and too many hours in front of the computer I'm sure. The RSI seems to be better over the last few days (touch wood) so I think the ergonomical adjustments might be working out. Moving house was supposed to take a week out from work, but it feels more like it took out four, which means a lot of catching up. This week I've had my head down inside Lawson Park Electronic Library, Rhyzom, Spatial Agency as well as a catch up meeting on Rossi and Rossi, some fixing bits on Colchester Inn, Grizedale Arts, and some work on on-line look books for jewellery designer Florian. The Colchester Inn site is being displayed from today at First Site in Colchester, as part of the overall project and development of the next phase, and in similar news an off-line version of DIY Regeneration is current being shown in the Camden Arts Center. First Site is a blast from the past as it's where some very early work I did with Julie Myers, Peeping Tom was exhibited in 1996, and I have fond memories of going to install it. I've been really enjoying the work this week, playing around with visualising information in different ways for each of the projects, and to get across the wealth of details and create a different experience with each project. Each of Lawson Park Electronic Library (LPEL), Rhyzom and Spatial Agency have a wealth of information in their own way, and I'm looking at ways of representing that and allowing it to grow over time from various sources, be it user contributions, a network updaters, or curated content. I've also really been enjoing playing with RaphaelJS this week, primarily for Spatial Agency but I can see it getting used in a lot of other places. I had a play with ProcessingJS and it also looks good, but it seemed to be a philosophical step - you were creating processing objects, rather than extending existing code. It also didn't work so well cross browser, whereas Raphael just seemed to integrate better with the current code base and what I was doing. Raphael is quite simple, but also powerful once you get into the SVG parts of it, and it's reasonably responsive so far (though I've yet to start dealign with Internet Explorer Issues). Hopefully this post will get me over my fear of weeknotes I've been suffering from for the last 4 weeks, and I'll get back into posting them now. I find it useful to reflect, and really useful to come back and look at these as well. A log of where my time drains to, as February turns into March and spring starts. After 10 years of my website I wanted to get a better idea of how I had been using and posting, and changing this site. so I have plotted all of my posts on a timeline to get a bettter understanding of it. it is a bit slow to render, and it will get slower, but I like it as a relative view of myself over time. Next task is to make my CMS work better with the iPhone.